Quang Tri (VNA) – A ceremony was held in Dong Ha city, the central province of Quang Tri, on April 4 to mark the International Day for Mine Awareness and Assistance in Mine Action. 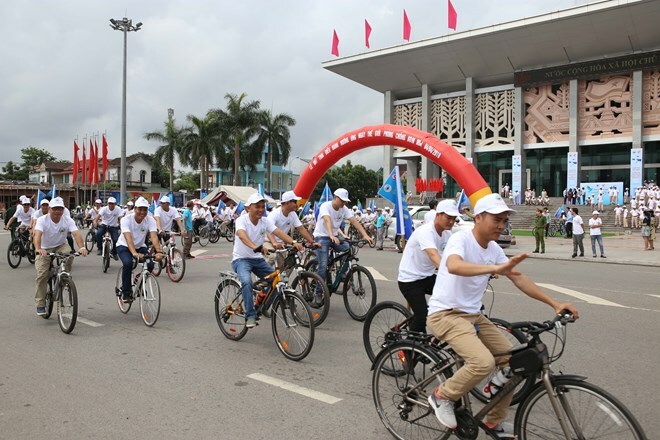 The event, organised by the Vietnam National Mine Action Centre and the provincial People’s Committee, attracted the participation of more than 1,000 people. At the ceremony, organisers presented 30 gift packs to disadvantaged unexploded ordnance (UXO) victims to support their livelihoods. A bicycle parade also took place to convey messages aiming to raise the public’s mine awareness. Earlier, a number of activities had been held in response to the International Mine Awareness Day (April 4) in Quang Tri, including UXO-related communications at local schools, an exhibition on UXO impact addressing activities, and a UXO clearance drill. Vietnam is one of the countries most contaminated with UXO. There are about 800,000 tonnes of UXO left from wartime in the country. The area of land contaminated or suspected to be contaminated with UXO totals some 6.13 million ha, accounting for 18.71 percent of the country’s total area. UXO scatters across all the 63 provinces and centrally-run cities, but most of those bombs and landmines concentrate in the central region. Since 1975 – when the war against the US completely ended, UXO explosions have killed more than 40,000 people and injured 60,000 others, most of whom were breadwinners and children. Over the past years, Vietnam has gained considerable achievements in the support for UXO victims, including providing orthopaedic surgeries and rehabilitation for the victims; assisting the victims in livelihoods, vocational learning and employment seeking; and ensuring that they benefit from social welfares. Quang Tri is one of the most UXO-polluted localities in Vietnam as it was the fiercest battlefield during the war. A survey in 2017 by the Ministry of National Defence shows that nearly 82 percent of this province’s area is contaminated with UXO. Nearly 8,540 local residents have become UXO victims since 1975. To address UXO consequences, the province has received international assistance in the work since 1996, clearing 9,174ha of land and deactivating over 538,000 bombs, mines and other explosives. More than 161,000 primary and high school students have also received UXO education.